Remember June 5th 2008? I’m sure you don’t, I’ll refresh your memory. Captain Scotty, part of the CFOX Jeff O’Neil morning show, dressed up in a beaver costume and tried to buy heroin on the Down Town East Side. It was broadcast live on air and it took less than 10 minutes for Scotty the beaver to score some Junk. Scotty, Jeff, and Charis (Charis is no longer with CFOX) were “suspended” later that day. This all happened right near the end of a ratings period and was clearly orchestrated. Fast forward to yesterday and the CFOX/CKNW simulcast that everyone is talking about. I’m not here to debate the things they said on the air, I’m here to tell you that this was planned, that CKNW was in on it, and that Chris Gailus and Squire Barnes were in on it. This is all a ratings ploy (for both stations) played out right before Christmas. The fact that Jeff, Scott, and Karen K are not back until early 2015 has nothing to do with the controversial simulcast, they take this time off every year for Christmas. Corus is playing it all up for ratings and I’m sure it’s working. But let’s all freak out on Social Media, because that’s helping. Ah Fort Langley, the place should be crawling with hipsters but it somehow isn’t. Coffee roasters on every corner, pop-up shops, hand made chocolates, antique stores. Seriously, the hipsters will come as soon as they put in bike lanes and a decent transit system. Anywho, right beside “Gasoline Alley”, which isn’t really an alley and yes it has a coffee roaster, is Say Cheese Gourmet Grilled Cheeserie. Say Cheese is a tiny shop, like REALLY small. Thankfully Gasoline Alley has picnic tables and grilled cheese is a good candidate for walking and eating. 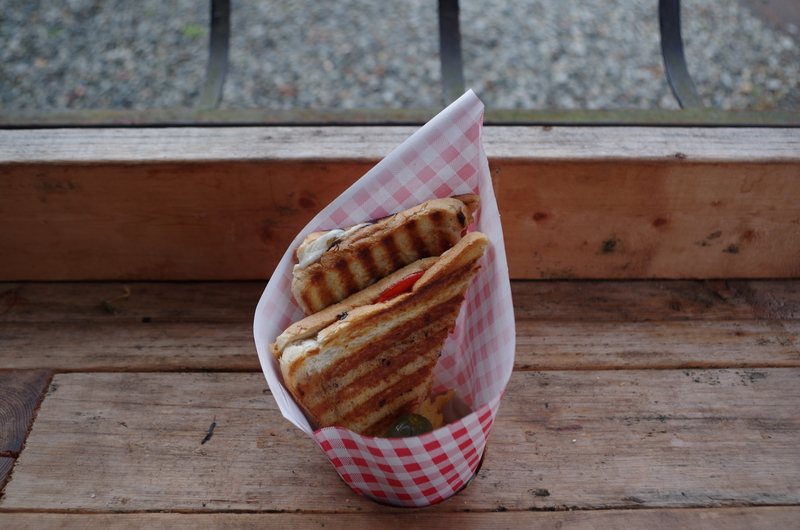 Grilled cheese in many varieties, soups, beverages, that’s pretty much the whole menu. Each sandwich comes with a pickle and potato chips. I had the pepperoni pizza grilled cheese. Let’s see how that went. From the pictures I’ve seen on the Say Cheese Facebook page I thought the pickle would be bigger. You can just see the top of it in the picture and there wasn’t much more hidden by the paper. The chips were good, nice and salty, thick cut regular potato chips. 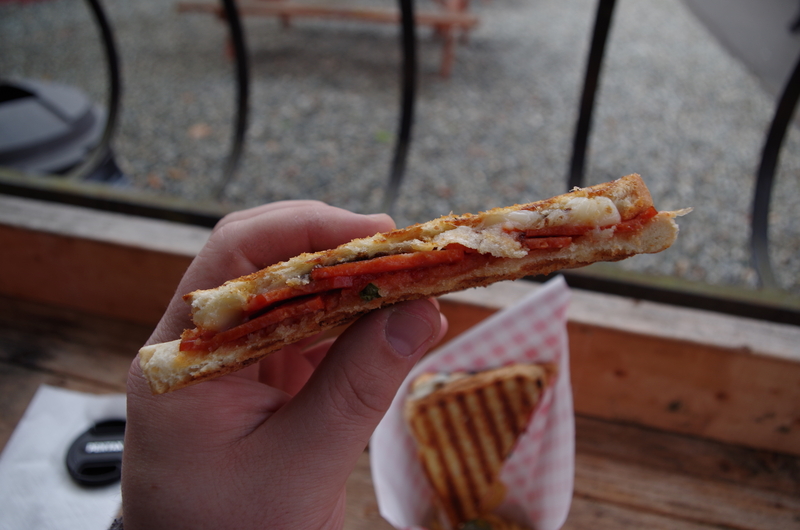 The sandwich had pepperoni, mozzarella, pizza sauce and some basil (I think). Tasty, yes. I was expecting more girth based on the few pictures I’ve seen. The bread was nice, I can only assume it was from a local artisan bakery because there’s a few of them (hipsters, seriously go check out Fort Langley). The pepperoni seemed like grocery store brand name pizza pepperoni, the kind you buy in a resealable bag. For $8 I expected more. The concept is good, the execution is lacking.